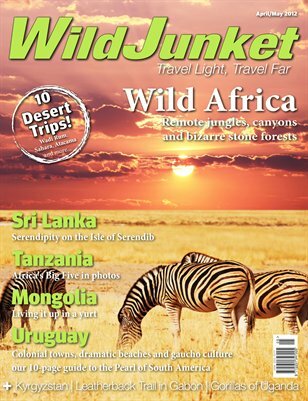 Our second issue has a special focus on Africa - with a cover feature on Madagascar, a photo essay of the Big Five in Tanzania, and a story on gorilla trekking in Uganda and chasing the leatherback trail in Gabon. We’ve also got inspiring travel features on the historical tales of Sri Lanka, China’s secret province of Inner Mongolia, as well as a comprehensive travel guide on Uruguay. We’ve got over 110 pages of travel goodness ranging from features to short travel stories to travel advice. In our Under the Radar department, we’re featuring Kyrgyzstan, a country blessed with dramatic landscapes, untouched nature and some of the most hospitable people in the world. Our Feast section brings us to the explosive city of Seoul, South Korea, where we hunt down the most bizarre street foods. Plus 10 desert trips and photo contributions from readers. We’ve also teamed up with Carrentals.co.uk to give away a one-week car rental anywhere in the world (literally) – check out page 89 for details!